What is the best position for typing? Learn the secret to why ergonomically correct low-profile keyboard trays are so effective. Do you know what the best position is for typing? Most workplaces might simply toss a computer keyboard on a table and say TYPE. Discover why low-profile keyboard trays add comfort to your workspace, ergonomically. Just like your knee, your wrist is primarily meant to bend one way - forward. 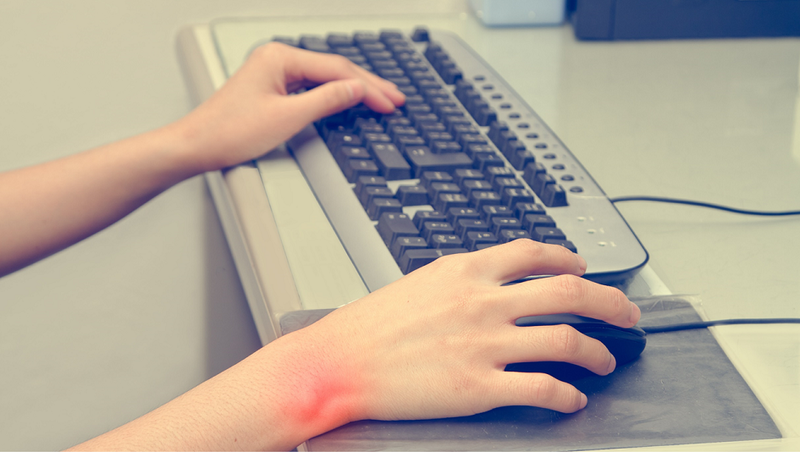 Therefore, in order to optimize ergonomics and comfort, you need to allow your wrists and fingers to move forward while typing. This gives you the best results. What does this mean in Plain English? It means that you will actually want your articulated keyboard trays to be below your body, but very close. This minimizes any unnecessary movements. It also allows for gravity to help you, every time you strike a key. If you could, having the keyboard tray in your lap would be optimal; although, many offices might think this looks a bit casual. The nice thing about our CotyTech adjustable keyboard trays is that we give you choices. We have two primary platforms and three attachment devices. You could ask your workers, which they prefer. When your typists hover above the keyboard, their wrists are not overextended backwards. This is called pronation - when a body part goes in a direction, it was not meant to go. If your workers feel like swiveling, tilting, raising or lowering one of our CotyTech ergonomic keyboard trays, they can. Sometimes, simply changing the angle of your keyboard can force you to use different wrist muscles. This can prevent you from permanently damaging wrist muscles. Repetitive stress disorders result from doing the same action, too many times in a row. When your employees have more control over their workspaces, they will be happier. They can experiment with different settings. Low profile keyboards are better for workers using some of those ergonomically correct chairs, where they are leaning forward with their legs behind them. Ergonomic comfort and user-friendly functionality is our specialty. By adding these keyboard trays to your computers, you can extend productivity and make your workers happy. Ergonomic keyboard trays are more comfortable, convenient and compatible with modern work environments. We have plenty of ergonomically-correct, low-profile keyboard trays, adjustable mounts and placement solutions to make your workspace, as comfortable as possible. You want to make your customers comfortable - it all starts with adding comfortable CotyTech equipment for your employees.